Timothy McDowell, the new Executive Chef of Catal in Downtown Disney Anaheim recently hosted a tasting event to highlight his fall menu. This is the third new menu since McDowell came to Catal; he has also introduced two new menus at Uva Bar. Timothy McDowell comes from a culinary family. His early career included stints at the Cheesecake Factory, Wolfgang Puck catering, and Monti’s La Casa Vieja in Tempe, Arizona. 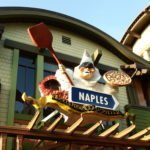 During a stint with the U.S. Navy he served as a culinary specialist for executives and Admirals of the Pacific Fleet. During this time he cooked in the kitchen at the White House. Most recently he directed culinary operations at USC, overseeing multiple restaurants. 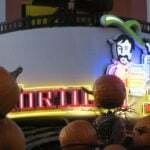 The call from Catal was a welcome one, as McDowell had been looking to work in Orange County, and longed to put his personal stamp on a fine dining establishment. The setting for the event was a second floor balcony. 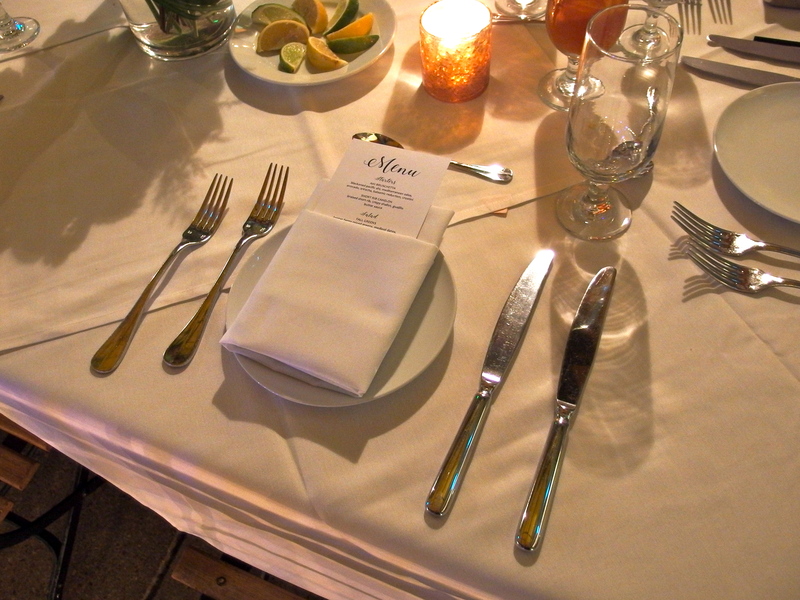 For the tasting a variety of utensils and glassware was set out; all would be used before the evening was over. A menu listed two starters, a salad, choice of one of three entrees, and choice of one of two desserts. A pre-appetizer was served before the starters. 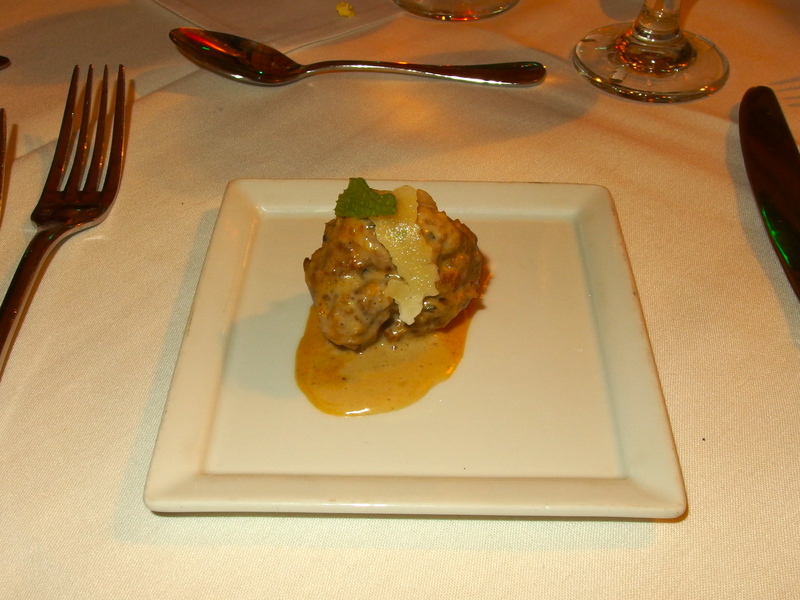 It was a lamb meatball, topped with shaved foie gras. Inspired by an item served at Amanda in New York City, the dish is included in the full menu at Catal as an entrée. The two starters were Ahi Bruschetta and Short Rib Canelon. 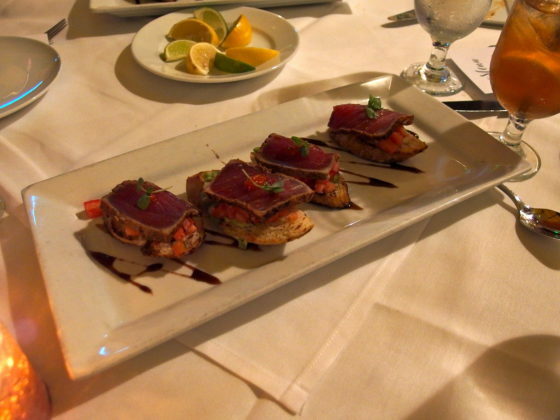 McDowell referred to the bruschetta as “our Southern California dish.” It consisted of blackened Pacific ahi, Mediterranean salsa, avocado, sriracha and balsamic reduction on a toasted baguette. 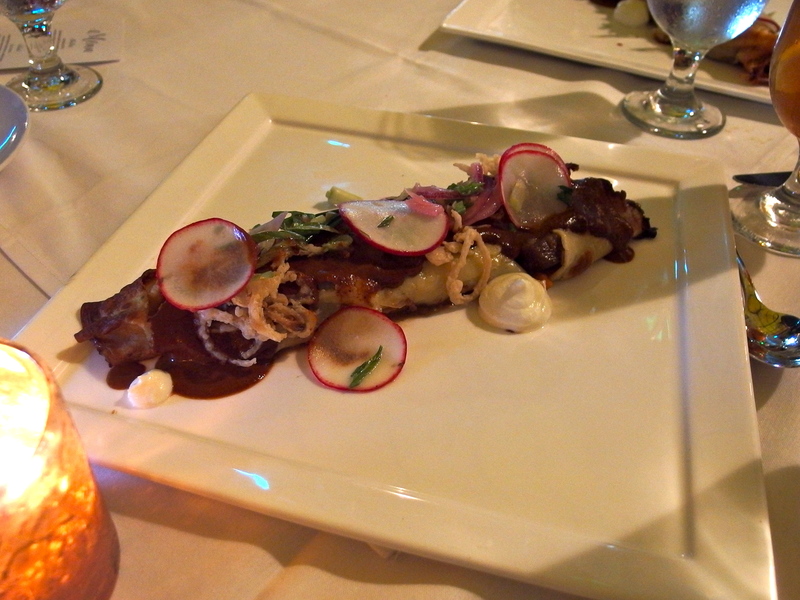 The second starter was something of a surprise, as the braised short rib with crispy shallot and guajillo butter sauce was served wrapped in a warm canelon, a kind of thin pancake. The meat was in the form of a ragout, with the sauce and shallots studded on the exterior. McDowell explained that the national dish of Barcelona, Spain inspired this item. 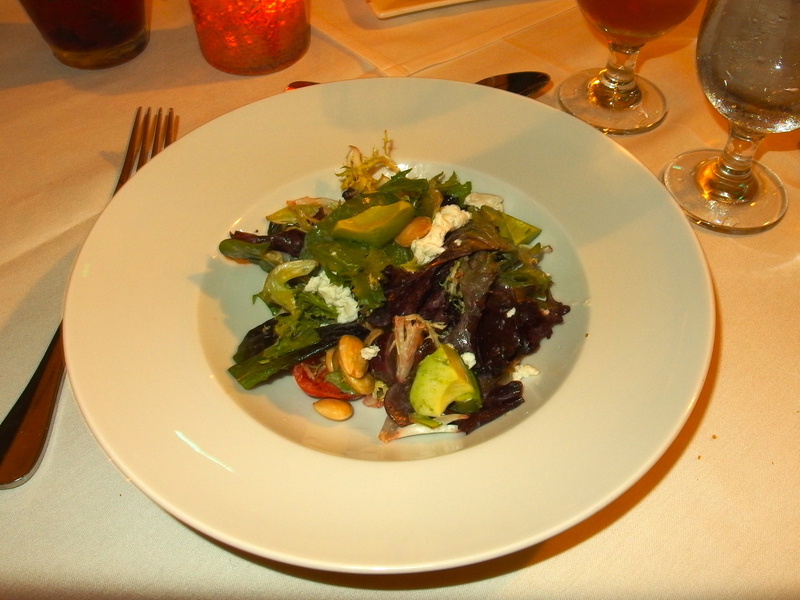 A salad of fall greens was served between the starters and the entrée. The mixture included Kenter Farms mixed greens, Medjool dates, avocado, Marcona almonds, grapes, goat cheese, and cherry tomatoes. It was dressed with a yogurt-based poppy seed dressing. As this was a tasting, the version served was smaller than the item on the menu. Three entrees were offered: Oxtail Ragu, Diver Scallops, and Porchetta. The ragout, served in a bowl, consisted of braised oxtail, masa gnocchi (a cornmeal based version of the traditional Italian dumpling), cilantro and pickled slaw. The scallops were served atop three kinds of mushrooms, maitake, shiitake, and crimini. resting on a bed of butternut squash puree. 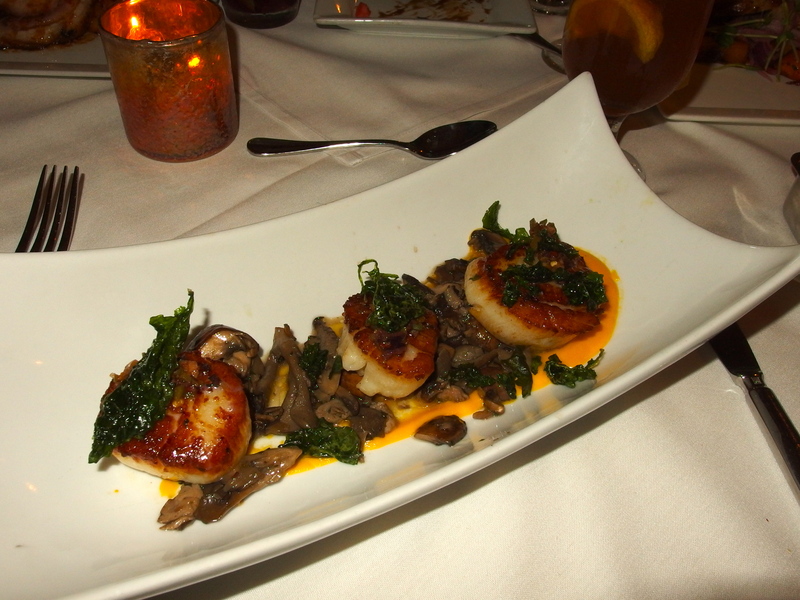 Each seared scallop was topped with crispy kale and drizzled with olive vinaigrette. 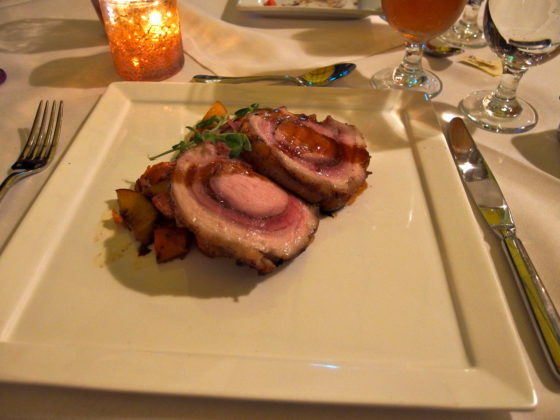 The Porchetta combined Salmon Creek pork loin wrapped in pork belly, drizzled with honey sage jus. It was served with crispy sweet potato and grilled stone fruit. McDowell pointed out that the Salmon Creek pork was range-free with no additives. The desserts were a study in contrasts. Tres Leches was a refreshing “fall version” of the traditional white sponge cake based dish, with sweet milk, buttermilk whipped cream, raspberries, and toasted coconut. Cardamom, allspice and cinnamon were added to this recipe. 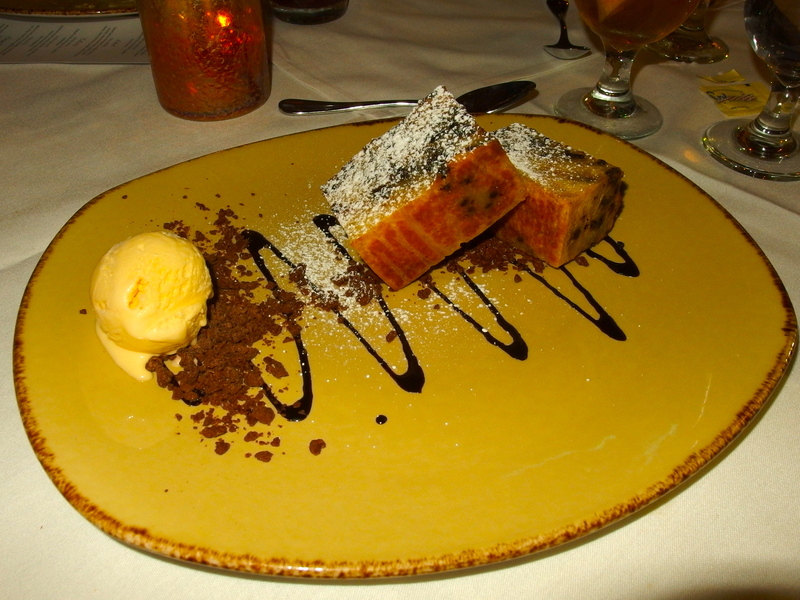 The second dessert was an indulgent Chocolate Chip Bread Pudding. 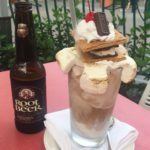 It was served with a drizzle of dark chocolate, crispy chocolate sprinkles, a dusting of powdered sugar, and with vanilla ice cream on the side. 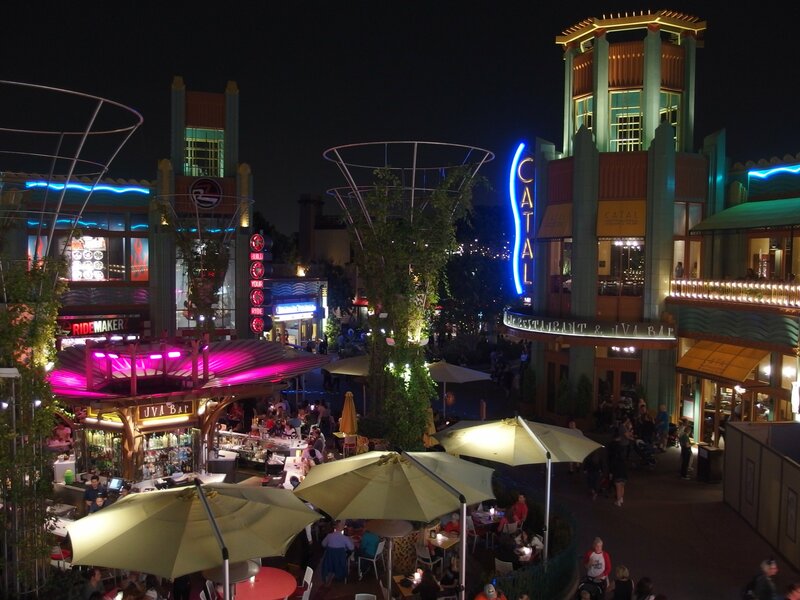 Catal is one of the original fine dining establishments in Downtown Disney Anaheim. 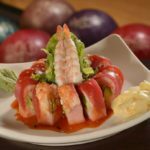 By refreshing its staff and menu, it aims to continue to offer guests at the Disneyland Resort new experiences and new taste sensations. Chef Timothy McDowell has answered that call.